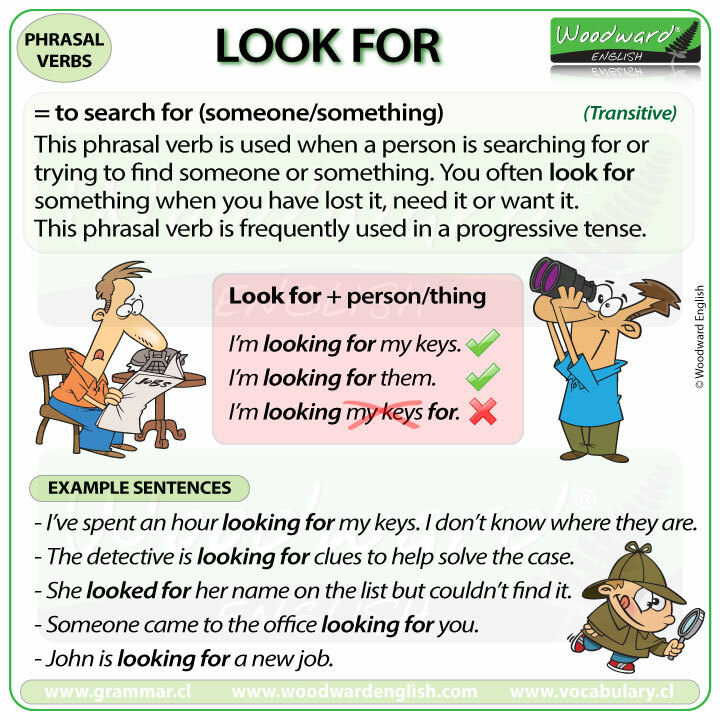 (transitive) When a person is searching for or trying to find someone or something. You often look for something when you have lost it or need it. A synonyms is to search. This phrasal verb is frequently used in a progressive tense. I’ve been looking for this book for years! She has been looking for love in all the wrong places. Someone came to the office looking for you. She looked for her name on the list but couldn’t find it. I have spent an hour looking for my keys. I don’t know where they are. B: Yes, I’m looking for some new shoes for work. Is this the magazine you were looking for? The detective is looking for clues to solve the case. He is looking for hidden treasure. Another use of looking for is in the expression: Looking for trouble. Looking for trouble = to behave in a way that is likely to get you into trouble or in an argument or fight. I wouldn’t do that if I were you… you are just looking for trouble if you do it.